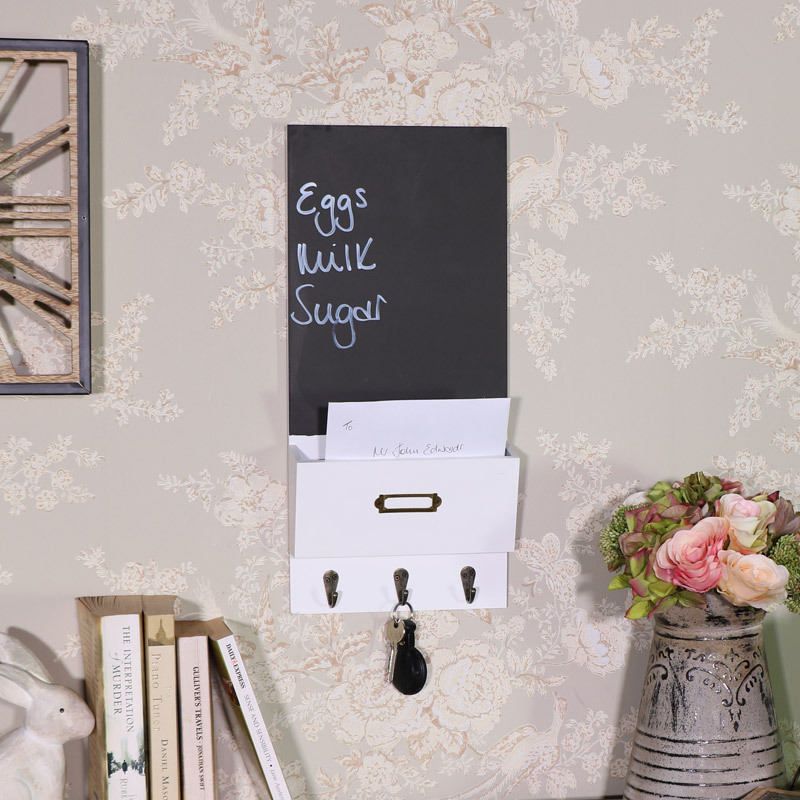 Keep yourself and your home organised with the help of this handy blackboard. In a great vintage style in a white painted finish. Ideal for placing in the kitchen. In a wonderful vintage style this is simply perfect for adding those 'to do' lists and reminders. The little box shelf is ideal for holding pens, letters and notes with 3 handy hooks underneath for holding keys, towels and the dog leads. with label holder and 3 hooks. Simple design that is practical and perfect for every home. (Please be aware that chalk pens are unsuitable for use with this board and may stain). Keep yourself and your home organised with the help of this handy blackboard. In a great vintage style in a white painted finish. Ideal for placing in the kitchen. In a wonderful vintage style this is simply perfect for adding those 'to do' lists and reminders. 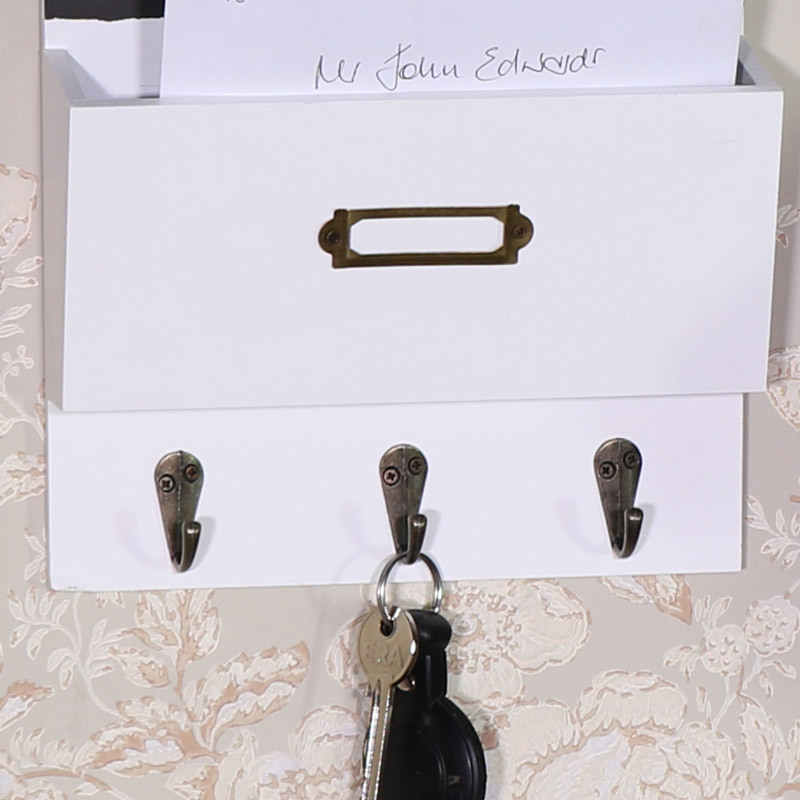 The little box shelf is ideal for holding pens, letters and notes with 3 handy hooks underneath for holding keys, towels and the dog leads. with label holder and 3 hooks. Simple design that is practical and perfect for every home. (Please be aware that chalk pens are unsuitable for use with this board and may stain). Made from wood and painted white with brass label holder and 3 hooks. Easily wall mounted with 2 hooks on the back.